Ahoy! You suited up for the adventure of a lifetime—parenthood—and now your little scallywag is ready for their first foray into the deep abyss...of Halloween! You always had a feeling your baby may just be made of magic, and now that you see them dressed as a mermaid, there's no mistaking it. And what is a mermaid without a pirate, sailing by her side, eh? And you, friend, are one fine pirate. You look ready to tackle anything, from pillaging and plundering to on-the-go diaper changes, not to mention all the arggghhhhs! you'll be yellin' when you can't sleep through the night. 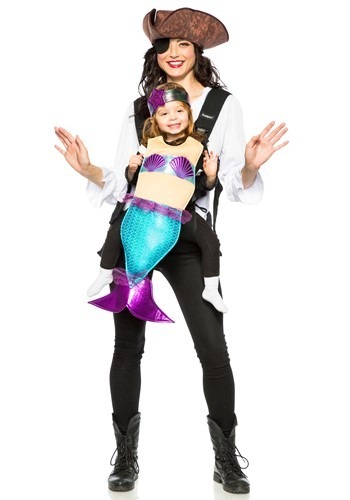 This Adult Pirate and Mermaid Toddler Carrier Costume, then, is the perfect way to celebrate your new life as a seafaring swashbuckler. Of course, being a pirate doesn't make early parenthood any easier, but it sure is fun to pretend, right? Plus, we hear having a mermaid in the house is an omen of good luck. And what parent doesn't need that? 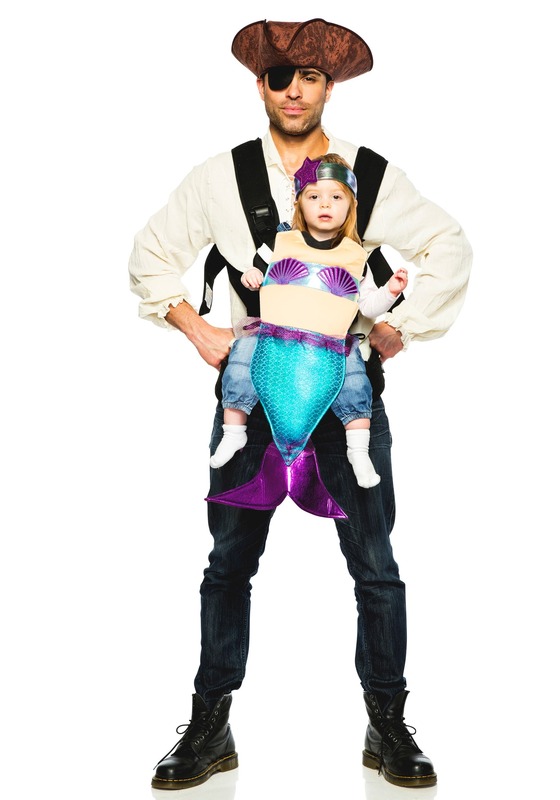 This is one clever costume—it means your utilitarian baby carrier (yawn) magically transforms into a baby costume that includes an iridescent tail, body cover, and shell top! Your little mermaid will even get her own headband with a shiny star accompaniment. You'll wear your best pirate gear and top it off with this hat and eye patch combo, and you'll both be ready to trick-or-treat to your heart's content. And while we think it would be pretty cool to be a mermaid, Halloween is a holiday celebrated only on dry land. So, we're glad you two decided to kick it with us landlubbers for a night! Just remember: no matter how much your little one wails, whines, or pleads...you're the Captain! That may not mean much to a mermaid, mind you, but it should make you feel a little bit better.